Ice skating in the Westfield Plaza. Winter may be over but we are bringing the icy chill back to you this Spring! Come and skate on real ice at Westfield Albany - In collaboration with Paradice Ice-Skating. Open during centre hours and also until 8pm on Saturdays. Entry cost: $13 per person for a one hour skate session which includes skate hire. You can purchase tickets online HERE to get priority access or pay when you arrive. Eftpos and credit card facilities available. Additional services include frame hire for young skaters $8 plus $2 return bond, and lockers $2 per hour. Please book these services onsite. The ice skating rink is owned and operated by Paradice Ice Skating. Please follow staff instruction and observe the rink rules. Children must be over 3 years old to skate. Please see the frequently asked questions below for more information or visit www.paradice.co.nz. Some frequently asked questions about the Paradice Mobile Ice Skating Rink. Yes 100% real ice for authentic ice skating! You may skate for up 60 minutes during any of the opening times. Please note we have a 65 person limit on the ice and online ticket purchasers will be given priority. Yes the admission cost includes skate hire. Parent or guardian spectators are free of charge. The temperature varies depending on the weather outside. It is approximately 12 degrees inside. Warm clothing is recommended. Also remember to bring your socks! We strongly advise using the lockers and not leaving bags, wallets, mobile phones lying around on seats. We accept no responsibility for lost or stolen items. Lockers are available and cost $2. These will fit a medium size bag and some shoes. While skating will normally warm you up it is advised that you bring warm clothing. Long sleeved tops and pants are recommended. Comfortable clothes that you can move freely in are ideal- and don’t forget, if you fall over you may get wet depending on the ice condition! Always wear socks for warmth and comfort while you are skating. We also recommend that small children wear gloves to keep their hands nice and warm. Scarves and beanies are optional. 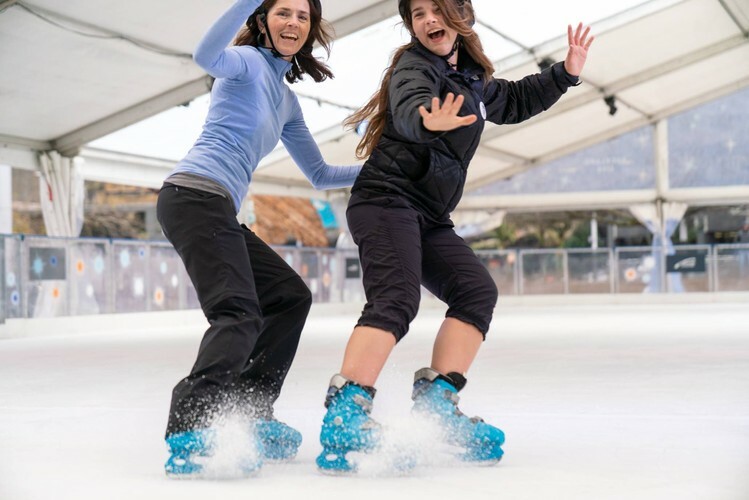 While ice skating is a safe and fun activity, Paradice recommends that our guests use helmets while they are skating for their protection against any accident that may occur. We have helmets available free of charge.